22 July 2015: Na kha-unga, nakhanedoonga (I will not eat, nor will I let others eat). Narendra Modi’s lofty announcements to Indian diaspora in USA, Australia and Canada sound hollow within a fortnight of his completing one year in office. His government is already grappling with credibility crisis. Every night, private TV channels dole out juicy details of involvement in various scandals and alleged corruption cases.Union foreign minister Sushma Swaraj, Rajasthan’s CM Vasundhara Raje and her son Dushyant Singh are embroiled in these controversies. Tweets abound and trend on Lalitgate scandal. As the beautiful and powerful of the land engage in screaming matches against each other’s’ position, the nation, according to Arnob Goswami of Times Now, wants to know all about Lalitgate. Times Now was the first to break the story and grip the attention of the cricket crazy nation. Then, what is Lalitgate and what it has got to do with cricket? It probably was so called because of its English origin; and because in India, only Maharajas played the game or patronized it. In India, the game was administered by Board of Control for Cricket in India (BCCI). It is a registered club of state cricket associations. 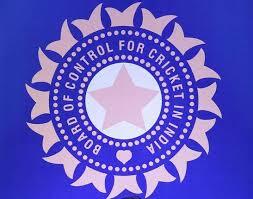 The state associations select their representatives who in turn elect the BCCI officials. After Independence, most maharajas turned politicians and therefore, it was natural that politicians controlled BCCI. 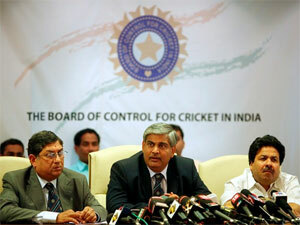 BCCI, in turn, was affiliated to ICC, the governing body of international cricket. Under ICC rules, Test cricket was played between former British colonies, each test lasting a maximum of five days. Cricket fans listened to matches commentary on radio, while even at work. Then TV came and cricket ceased to be a mere sport; it became entertainment and money minting machine.BCCI introduced an ODI format named Fifty-fifty and put a stamp of approval to the business. To get a slice of the pie, Subash Chandra Goel of Zee TV funded a rival private cricket league named Indian Cricket League (ICL) in 2007. BCCI countered the threat to its monopoly, and put Lalit Modi in charge of starting a twenty20 league of its own. The official league named as the Indian Premier League (IPL) was launched in April 2008. IPL sold franchises to city clubs owned by multi-millionaires by auction. There was great rivalry at auctions to get IPL franchise and for buying out-performing cricket players. Cricket was no longer a gentleman’s game; it became a business activity akin to horse-racing. Simply, Lalit Modi was born with a silver spoon in 1963 to KK Modi, the eldest son of Gujar Mal Modi, the founder of Modi Group, an eminent industrial house. In addition to his role in expanding family businesses, Lalit Modi launched his own business career in marketing of Sports, Fashion and Lottery businesses. Naturally, he drew upon the family network of elites including powerful politicians across party lines. Daughter of BJP’svery senior leader Vijayaraje Scindia, ex-Rajamata of Gwalior, Vasundhara Raje was elected as Rajasthan CM in 2003. Lalit Modi lost no time to emerge as one of her closest associates. Some alleged that he was Super CM. In 2005, Lalit Modi got Raje to get Rajasthan Sports Act passed, and consequently wrested control of Rajasthan Cricket Association (RCA) from Kishore Rungta, another powerful industrialist. He then helped NCP supremo and union Minster of Agriculture Sharad Pawar to become President of BCCI, who in turn appointed him as Vice-President. He quickly commercialized cricket and founded Indian Premier League. IPL, launched under his stewardship, blended Bollywood glamor, political intrigue, international gambling and liquor-spilled glitzy after-midnight fun parties with hysterical cricket fans and celebrities. IPL franchises were sold to billionaires who formed Cricket Teams named after major cities. Successful cricket players, Indian and foreign, were bought at auctions for unheard of sums in several crores. Millions watched the teams play, at the stadia, on TV screens, on smart mobile phones and on internet. Money poured into the coffers of BCCI, which in 2008 made Rupees 5400 crore profit. The phenomenal commercial success brought controversies around cricket. The players, team owners, and BCCI officials were accused of wrong-doing, especially engaging in betting, game fixing, spot fixing and black money laundering. 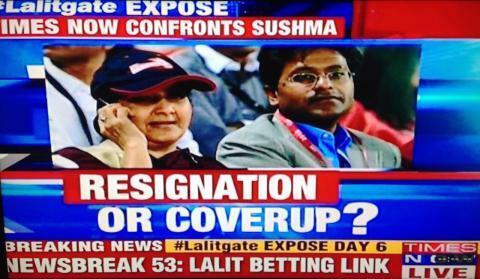 As the supreme boss of IPL, the dirt hit Lalit Modi too. Hewas soon hounded by his powerful enemies. He had to make his escape, not only from the game of cricket but also from the country. In 2010, he went to England and applied for residency. The Enforcement Directorate (ED), controlled by finance ministry under UPA government, issued notices for him to return to India and face justice. He did not respond, and in retaliation his Indian passport was cancelled. His lawyers fought in Indian courts for restoration of his passport even as his immigration plea was heard by British immigration authorities. In his support, Vasundhara Raje affirmed for him on the condition that her act should never be disclosed to Indian government authorities. Further, it was disclosed that Sushma Swaraj in her capacity as Union External Affairs Minister in NDA government in 2014, interceded with British government authorities so that he is issued with travel documents, which were granted. The opposition alleged that she had vested interests because her husband Kaushal Swaraj and daughter Bansuri Swaraj were corporate lawyers for Lalit Modi and Modi Group. It was also disclosed that Kaushal Swaraj was offered Alternate Director position in a group company that Lalit Modi heads. Opposition Congress party and AAP pressed for Narendra Modi to break his silence and demandedher resignation on alleged quid pro quo. Lalit Modi responded in his typical style. He used twitter to post regular but intriguing short posts revealing like an item girl in Indian cinema. He hid more than he revealed, but what he revealed was enough for scandal hungry Indian imagination to go wild for more gossip, rumors and sleazy canards to be brought into their living rooms. At the time of writing, Lalit Modi has involved and sullied the names of many top administrators, industrialists, business tycoons, politicians, and even media personalities. Lalit Modi has friends and enemies in all political parties, in Industrialists camps, among media tycoons, celebrities and elite socialites. In 2010, his friends among Indian government authorities, especially Rajiv Shukla and Shashi Tharoor tried to help him in his fight against Srinivasan (an IPL franchisee and a BCCI President) and associates. They are alleged to have facilitated his escape from the country. Lalit Modi’s tweets suggest that a lobby within UPA government led by P. Chidambaram tried to implicate him alone for IPL frauds. Srinivasan is discredited and ejected out of ICC and BCCI, which is now controlled by Jag Mohan Dalmiya. Dalmiya is a veteran BCCI administrator who is also nicknamed in the media as the Machiavelli of Indian cricket, master of realpolitik, and master of comebacks and so on. Under his watch, more disclosures of IPL frauds during 2008-2014 could happen, drawing more names into Lalitgate. So far, the Lalitgate controversy has exposed the BJP’s so-called clean politics plank. If Narendra Modi is not involved in the Lalitgate row, he should speak out. After all, both Modi and BJP President Amit Shah were administrators in Gujarat Cricket Association during the controversial period. He should immediately sack external affairs minister Sushma Swaraj and force Rajasthan chief minister Vasundhara Raje to step down. Veteran BJP leader L.K. Advani had recently said that when his name cropped up in the Jain hawala case, he himself had offered to quit the government. That was explicit hint to tainted minsters in Narendra Modi’s government. But Narendra Modi is unlikely to pay any heed. He and BJP may opt to brazen it out. The media will soon find another juicy story of erstwhile UPA corruption scams and publicattention will be diverted. The monsoon session of Parliament begins on Tuesday, 21st July. The PM had already rejected the Opposition Demands made in the course of All Party Meet held on Monday, 20th July. He and BJP top brass has opted for aggressive strategies of tackling the opposition onslaught on the floor of the house. According to their calculus, amidst din and disruptions, the opposition walk-would facilitate moving of important bills and passing them without debates. At the end of the day, government is served, if not the country! Social Environment as the Nursery of a Person’s Upbringing…. The joy of growing plants and flowers at home!! Five days left to the close of monsoon session of parliament. The politicians have found a way to orchestrate their drama: suspension of unruly Congress MPs, followed by 8 opposition parties boycotting the session so that the listed legislations could be passed with voice vote within a few hours. Everyone s face is saved! Business as usual will continue outside the house and behind public glare. This is a beautiful analysis exposing all Politicians. By doing this Mr Philip Mudartha has given publicity to a stupid act of the politicians. All are stupid so they are in politics. best is to ignore them so that they will be hidden from the News, is my view. There in no one clean or saacha among politicians as on date. Yes, to some extent Cricket is not gentleman s game anymore! Many lose ethics when they see money spin! Politicians gain easy access to such money! Nicely compiled article on Lalitgate!! Lalit Kumar Modi, the founder of biggest Indian sporting event and the world’s hottest sports league (IPL), which had earned Indian Government crores in taxes and popularity. Son of one of the most reputed industrial family. There are charges on him of money laundering much smaller than his fellow members of BCCI, who are still free like him and many of them hold positions in India’s main political parties as well. All though this is wrong but we must understand that these things cannot be avoided in a democracy. In India cricket and politics go hand in hand. The so called Lalitgate will remain open for the national T.V. channels for years to come, as we all know how these hot topic /scandals will go on!. The article from my very dear friend Philip gives you the in-depth scenario in the Indian political systems which most corrupt from the word go. I truly enjoyed reading this particular article from one of the most respected and highly rated BV columnist, who rarely touches the cricket related subject! Thank you. Thanks Philip for highlighting the Lalitgate in simple narration putting in right perspective the background and the role of Lalit Modi in the IPL scam along with the political leaders of both BJP and Congress parties. Lalit Modi had political leaders as friends irrespective of their political affiliation that is why he is calling shots from London and being least bothered about the government taking any action against him as it is obvious that these political leaders had some kind of share in the IPL pie and Lalit Modi being in London serves them well rather than him being extradited to India. 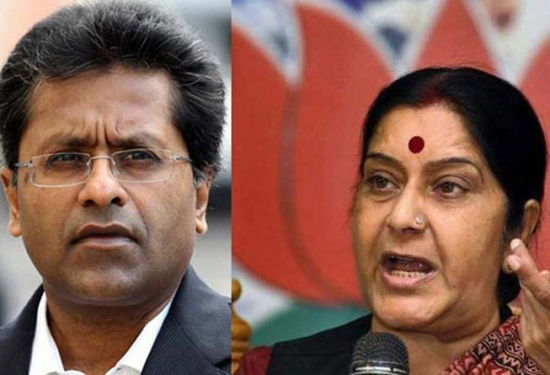 As far as the refusal of Sushma Swaraj and Vasundara Raje for their role in the Lalitgate are concerned, they are confident that they will not be forced to do so by the party as many more may have to follow suit for their support to Lalit Modi in one way or the other. As you have rightly pointed out the Lalitgate has belied the lofty election time slogan of Narendra Modi "Na Khaunga, nahi khanedoonga". His golden silence on this and other issues is much more louder than the silence of Moun Mohan Singh .